ISIS has now submitted an Outline Planning Application for the proposals at Brentford Lock West, also known as Commerce Rd, behind the Holiday Inn. The registered planning application can now be viewed on the council website. 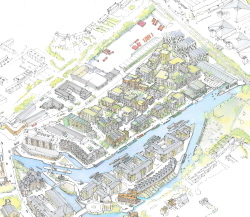 · provision of space for a small cafe and / or restaurant in the new canal-side square.